Puccinia graminis tritici is the pathogen that causes wheat stem rust. This disease favors hot days (77-86°) and mild nights (59-68°), which is a good range for a lot of the crop production areas that are affected. It also favors wet conditions and rainfall. There is a loss of yield of wheat crops in a few different ways. One way is the fungus absorbs nutrients that should be used for grain development. This fungal infection can also allow for other fungi and bacteria to infect the plant. This stem rust also can cause lodging, which makes harvesting nearly impossible. If conditions are right for this plant, 50-70% of the crop can be lost. The particular disease that I have chosen is also one that requires and alternate host, which is barberry, to significantly impact the yield of the crop. This means that the eradication of the barberry plant can positively impact the yields of the wheat crop. The ban on barberry plants also helps to prevent the development of resistant races of the fungal disease. In addition to eradication of barberry plants as a control method, cultural practices, genetic resistance and chemical control also help to keep the Wheat Stem Rust disease at bay. As stem rust is a major disease of wheat and even barley, these control methods are very important to the production of the largest food crop in the world, wheat. Bean Leaf Beetle (BLB) is a major pest in soybean production. It can be a very illusive insect for many producers because unlike many insects that attack soybeans this beetle attacks soybeans twice a year. First sighting of the BLB can be early in the season, usually in first planted fields in the county or local area. The beetles feed on the new foliage causing an abundance of defoliation in the newer succulent tissues. The beetles seem to be more prevalent where more crop residue is present on the soil surface. Early season damage is usually minimal so a spray is usually not required. After several weeks of feasting on the new growth, the BLB mates, lays its eggs into the soil and carries out the rest of its life until eaten by a predator or death of natural causes. The eggs remain in the soil, hatch, and larva emerge. By mid-growing season, the larva of the BLB then begins to feed on the roots and nodules produced by the soybean plant. Feeding on the roots and nodules can invite unwanted pathogens or bacteria into the plant that can harm overall plant health. These larva feed and then resort to the pupa form to complete its final stage before adulthood and sexual maturity. Once emerged from the soil, the BLB begins to feast on everything edible. Leaves, buds, and new pods are on the menu for this pest. Chewing of the pods can cause major yield loss and more pathogens to enter. This can reduce overall grain quality and takes cash out of the farmer’s pocket. BLB can also transmit Bean Pod Mottle virus which can affect growers who save seed or growers who are producing soybean seed. Potato blight greatly affected Europe in the 1840’s. The disease caused the loss of potato crops and over 1 million people to die in Ireland due to starvation, and a million more to leave Ireland. Ships from the United States are supposedly the cause of the introduction of the pathogen Phytophthora infestans to Ireland. This pathogen did not only affect Ireland, but affected central Europe; Belgium, The Netherlands, France, and England. The fungus-like organism would enter the plant, fermenting and releasing a stinky stench until they turned black. This was the first time anyone in Ireland had seen anything like this, and were first thought to be edible. But a few days later they would shrivel and rot.The people of Ireland though this was the cause of the new locomotive trains, and vapor from volcanoes. This was also the beginning of the study of plant diseases, or plant pathology. “Great Famine.” Encyclopædia Britannica. Encyclopædia Britannica, inc., n.d. Web. 01 Feb. 2017. “Plant Disease: A Threat to Global Food Security.” Plant Disease: A Threat to Global Food Security | Annual Review of Phytopathology. N.p., n.d. Web. 01 Feb. 2017. “The History Place – Irish Potato Famine: The Blight Begins.” The History Place – Irish Potato Famine: The Blight Begins. N.p., 2000. Web. 01 Feb. 2017. Southern Corn Rust is a corn disease that turns out to be getting a little bit out of where it is supposed to be, according to its geographical name. This rust, typically infecting corn in the Southern corn growing states, happened to make its way north as far as Indiana, Illinois, Nebraska and Missouri. According to The Progressive Farmer, Southern corn rust made its way into Georgia by early June. Kansas had it by late June. It traveled up north by storms carrying the pathogens up that way and then releasing them when it rains. The pathogen from this rust thrives in Southern weather like hot and humid weather. The moisture combined with the heat is perfect for development. Kansas lost 10% of their yield this past year, according to (source). Typically, southern fields lost 25 bushels per acre. There are some extreme cases losing up to 80 bushels per acre. One of the major problems with this disease is that it spreads so easily that is very difficult to control. Unfortunately, there are not very many corn hybrids out there that are resistant to this disease. The best thing farmers can do is an integrated pest management program in their cropping system involving the use of cultural and chemical practices especially. There is not a cure all for it but there are things that can be done to help avoid the problems. Sudden Death Syndrome (SDS) is a disease that impacts soybeans in a big way. This disease will attack plants fast with little to no symptoms. This really plays a big role in food production because of the unexpected yield loss that may occur. By the time a farmer or agronomist may catch it, it is probably too late to treat and for it to be a successful treatment. The global impact will not be severe on field to field bases, but if it becomes a state to state problem then it will really show an impact. United States moves a lot of soybeans out to feed other countries such as China and India. So losing yield can add up quick. The world is growing is population fast, and we need to be efficient as possible and that means not having disease. SDS will not help feed the world but contribute to food shortage. There are a couple of ways to prevent this from becoming a problem for soybeans. Crop rotation is a key to keeping the disease down but also with residue management and not keeping infected residue in the area. These management strategies will not stop the disease but simply prevent it from getting worse. Background/General – Palmer Amaranth (Amaranthus palmeri) is an invasive pigweed species that is quickly spreading from the Southwest U.S. to the Southeast and Midwest of the country. Palmer Amaranth can be confused with pigweed. There is no hair on the leaves or stems of the plant, the leaf pattern is ovate to diamond leaves that are widest near the base. The leaves have long petioles and the seed head is spiked. This weed causes significant yield loss in fields of up to 90%. Female Palmer plants can produce anywhere from 100,000 – 500,000 seeds per plant. The emergence period is from April to August which gives the plant plenty of time to grow, produce seeds and cause yield loss. This plant can grow up to 3 inches a day under the correct growing conditions. If herbicide is not applied before the plant reaches three inches in height the herbicide will be ineffective. To lower the rate of invasion of palmer amaranth it is important to know how to identify Palmer and to always be aware if there is any in the area. If buying or using equipment, know where the equipment has been and properly clean it before moving fields or areas. Residual herbicides should be included in the program for corn and soybeans to control early emerging palmer plants. To discover palmer plants that were unaffected by the herbicide plan scout fields in mid-July. All palmer plants discovered in the field should be pulled and removed from the field. Palmer is resistant to glyphosate which causes herbicide programs to increase in rate as well as cost for farmers. The potato famine was one of the worst food shortage epidemics to take place in Europe during the 19th century. The potato blight fungal disease didn’t just take place in Ireland, but it was spread throughout central Europe making its way into the surrounding countries. About one out of five died in Ireland from starvation or disease during the potato famine. The potato famine was so devastating to Ireland because over one third of the Irish population was dependent on potatoes whether it be religious, economic, social, or political views. The potato famine caused a little over one million deaths just in Ireland alone, which was about one-eighth of the population. Over two million Irish fled to the “New World” and many other countries because of starvation, and the government doing nothing about the situation. The high wind speeds and warmer wet weather conditions in Ireland, are the perfect environment for the potato blight to thrive and spread in. The weather in Ireland spread the pathogen like wild fire throughout the country and other countries depleting the potato supply. Right around ten days of infection, the potato would shrivel up and rot. This happened because the fungus would get inside and start fermenting and cause the leaves and roots to fail which caused the rotting. “BBC – History – British History in Depth: The Irish Famine.” BBC News. BBC, n.d. Web. 01 Feb. 2017. “Great Famine.” Encyclopædia Britannica. Encyclopædia Britannica, Inc., n.d. Web. 30 Jan. 2017. Every day that I wake with some sort of productivity in mind, my go-to brain food is the banana. It’s delicious, nutritious, and no cooking is required. A huge plus. Being rich in potassium that aids in preventing cramping, bananas are also a great post-workout snack for me because I’m lazy and don’t stretch too well. Also, Hollaback Girl is a great song. But I digress from my affection with the banana to bring forth this news: the banana is in trouble, people. An article published in October, 2016 from the website, The Conversation, brought to my attention that the renowned Cavendish banana, the one that everyone eats, is under attack from a new disease called Black Sigatoka, caused by the fungus Pseudocercospora fijiensis. Black Sigatoka has swept through Central and South America, causing a drop in yield by upwards of 50% for some growers. This is obviously terrible news for the producers and it’s going to hurt consumers too. Drawing back to my learnings from remedial economics, I postulate that as supply goes down, prices rise. I love bananas, but I’m also a poor college student. If the banana shelves at the store are low, so are the funds in my wallet. Fun fact: the Cavendish banana is grown in monoculture, which means that banana farms pretty much grow just this one type of banana. The farms will be much more susceptible to disease and suspect to greater loss than polyculture farms. The good news is that this isn’t the first major epidemic for the banana. In the 60’s, before the Cavendish, we imported Big Mike bananas, but then the Big Mike’s were struck by a disease called Fusarium Wilt. We don’t eat Big Mike bananas anymore. Steps are being taken to prevent a collapse including new breeding techniques and polyculture farms. Let’s just hope it isn’t too late. John Zagar is a student at The Ohio State University studying to earn a Sustainable Plant Systems Major with a specialization in Turfgrasses. Besides his love for bananas, John is also loves anything basketball, but none of that college stuff, it’s weak. March Madness is cool though. Go Cavs! If you just planted some seedlings and they aren’t sprouting . . . Check to see if the seeds are outdated, old seeds have poor germination. Look to see the depth requirement of the seed, you may have planted the seedling to deep or too shallow. Also see how compacted the soil is, this leads to not enough air and water reaching the seed. Temperature also greatly affects seed germination, if it is too hot it could lead to the soil drying out. If there is too much precipitation, the soil will retain too much water and thus be too wet. If you notice the seed sprouting, but it isn’t growing as it should . . . Check to make sure you planted the seed in the correct lighting, too much or too little sunlight leads to poor growth. If you notice that the leaves are “burnt” at the tips, review your fertilizer and pesticide use. If you have a full-sized plant . . . If you notice slow growth check your lighting again, see how compact the soil is, and make sure it is getting adequate water. If you notice the roots are surfacing, you may be over watering your plant. You want to check the leaves of your plant to see if there are any adverse leaf colorings. Hopefully these tips and tricks will help you discover diseases within your garden or fields and help you establish a healthy crop. My name is Stephanie Wuebben and I am a third year at The Ohio State University in Columbus. I transferred from Ohio State Agricultural Technical Institute in Wooster where I graduated with my Associate’s degree in Agriscience Education to Columbus to complete my Bachelor’s degree in the same area. Operating a golf course as a golf professional requires knowledge of current growing conditions of the turfgrass. Although the golf course superintendent manages the playing conditions and quality of the turf, high quality turf conditions are the root of the business. I picked this article specifically because of the impact Pythium root rot has on the turf quality in the Midwest, including Ohio golf. 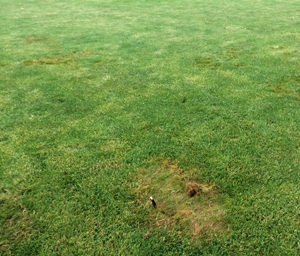 Pythium root rot, also known as Pythium Blight, is a fungal disease that affects the roots of bentgrass greens on a golf course. This pathogen infects bentgrass roots during the fall and spring and reduces their ability to absorb water and nutrients from the soil. The disease develops when temperatures are between 55 and 75 in fall winter and spring when moisture levels are high. Signs of the disease include yellowing or browning of the turf usually in circles or irregular patterns around two feet in diameter. Symptoms begin to show in drought conditions with temperatures above 85. During this hot condition the plant needs to utilize nutrients and water but the disease prevents it. Pythium root rot can be controlled and prevented using several methods. First, increasing the length of the grass on the putting surface can alleviate stress caused by harsh conditions. Second, frequent aeration and topdressing will keep air and water moving through the soil. Lastly, proper fertilizer and fungicides can increase the health while decreasing the disease on the plant. The putting green is the most important surface on a golf course. Proper maintenance of the turf can keep the grass healthy and the customers happy. Most people believe that lots of water and sun is the recipe for healthy plants, but in the right conditions, that is what causes them to die. Max Rehfus is currently a Junior studying Professional Golf Management at The Ohio State University. He is pursuing a Bachelor of Science degree with a Business minor. Once graduated he is looking forward to become an assistant or head golf professional at a private country club.